The age-old story of the Passion of Our Lord Jesus Christ, although 2,000 years old, keeps inspiring composers even to this day. And with good reason, as this is not just a great event in the history of mankind, but the event on which the universe survives and of which we now all carry its mark. 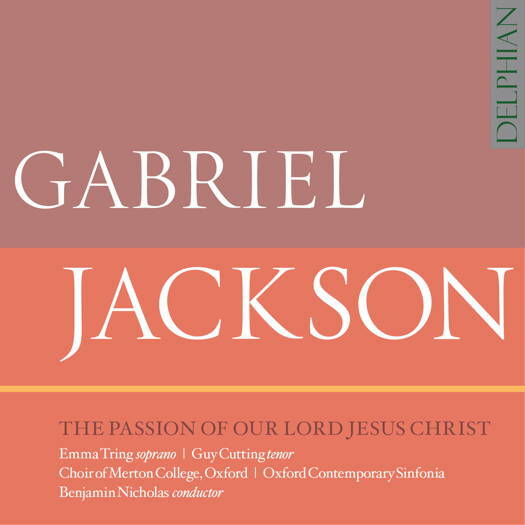 Gabriel Jackson's Passion of Our Lord Jesus Christ is inscribed with a title that places it strongly within a centuries-old tradition of music celebrating the betrayal, suffering, crucifixion and death of Jesus Christ, but while it humbly embraces that tradition, musically and especially liturgically, it stands apart from it. The text finds its main inspiration from the four Gospel accounts, but librettist Simon Jones and Jackson also include Latin and English sacred poetry, and even secular verse related to its themes, and by ancient writers. By doing so, the composer makes of this work a beacon of God's love, giving faith and hope in an all too turbulent and cruel secular world to those who really thirst for mercy and justice. This seventy-minute piece is divided into seven sections commencing with Palm Sunday and followed by Anointing at Bethany, Last Supper and Footwashing, Gethsamene, Caiphas, Peter and Pilate, Crucifixion and The End and the Beginning. For this final movement Jones and the composer selected lines from T S Eliot's poem Little Gidding, thus relaying the message that everything worldly is transient, and yet eternity awaits us all in God's bosom through the infinite merits of Christ's Passion. Richly imaginative and strikingly coloured, Jackson's Passion is indeed a work of deep spirituality and profound dramatic impact that complements the ecstatic sorrow of the story within a well nigh perfect musical structure. Emotionally charged performances, superb sound quality and highly informative annotations complete a revelatory disc that is wholly in tune with the present Lenten season. One small piece of advice. Do read the notes before you listen. You will find much that will help you not only enjoy the music, but also to reflect on God's love for mankind.